The instrument has an extremely fine decoration and a stunningly-beautiful stand. The inside of the lid bears a French painting of a rural landscape with figures and cattle which must have been painted in 1750 when the case was widened for the first time. 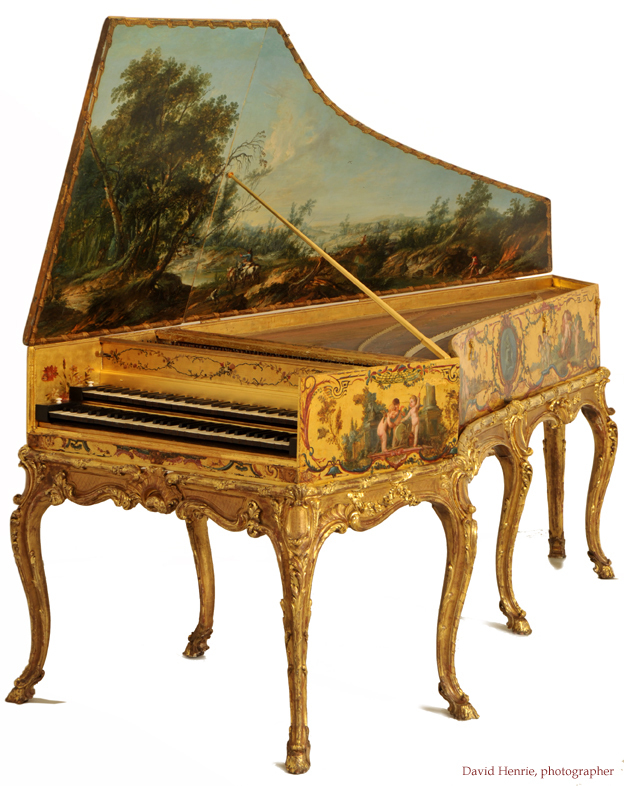 The whole of the outside of the instrument is decorated in gold vernis martin. The lockboard, bentside and cheek of the case has figures of putti engaged in amorous pursuits. The outside of the lid has 2 large paintings and an elegant roccoco decoration around these. The musical part of this alteration has been dated 1750 from the date on the surviving jacks. Although the instrument was then modified musically at least 2 more times, the general extremely high quality of both the decoration and the musical and mechanical attributes indicated above was preserved and maintained. But it is also clear from the construction of the instrument and the signs left of the widening of the instrument, that the majority of the paintings and decoration was carried out in 1750 as well. The figure paintings on the instrument are attributed to François Boucher (1703 -1770) and the ornaments surrounding them are attributed to Christophe Huet (1700 - 1759. Both of these were carried out in Paris in 1750, the date of the musical ravalement. 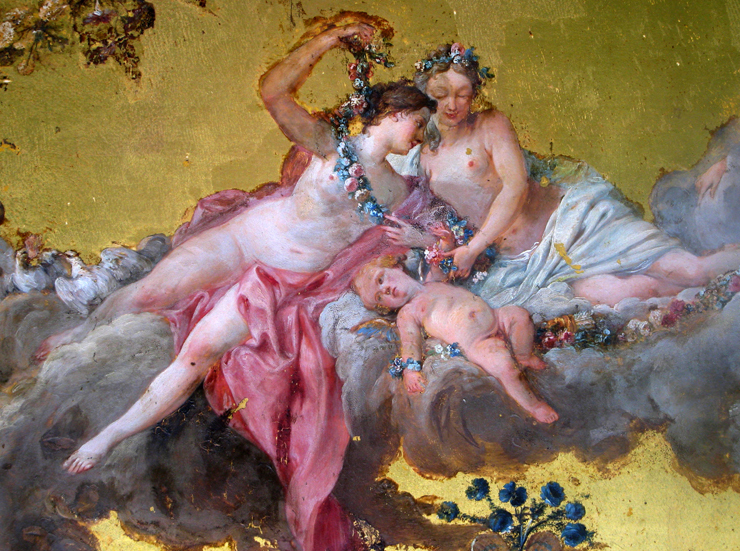 There also seems a strong likelihood that the instrument belonged to Louis XV and was a part of his personal property, and that he had an image of his mistress Louisa O'Murphy added to the already-existing Boucher painting. In the period around 1786, the instrument was again widened, but this time on the treble side in order extend it up to f3 and give it a full 5-octave F1 to f3 compass. This alteration was carried out by Jacques Barberini, whose calling card was found glued to the inside surface of the baseboard when the instrument was opened by Roberto de Regina in Buenos Aires in 1970, and by by Nicolas Hoffman who added a genouillère and additional fourth peau de buffle register. The later alteration was signed on the near surface of the lower belly rail '[Re]fait par [N] Hoffman a Paris 1786'. This is written upside down when viewed from inside the keywell probably indicating that it was signed after the lower belly rail was put in place and before the baseboard was placed on the instrument. In the last eighteenth-century state the instrument would have had four registers with an extra ‘peau de buffle’ register at the rear of the gap. This register was fitted with soft leather plectra instead of bird quill. It would then also have had a 'genouillère' (knee-lever) for changing the registration. The genouillère would normally have been capable of withdrawing the quill registers, one register at a time to give a gradual diminuendo to the solo peau de buffle, and then of slowly re-inserting the registers again one at a time to give a crescendo to a full plein jeu with all of the registers engaged and sounding. The ravalement framing, both of the 1750 bass ravalement and of the later ravalement, is very well designed and carried out and, from a statics point of view, provides an extremely rigid and stable structure to the case. The soundboard is laid out in the classic Flemish way and, as I have pointed out in my articles referred to below, sounds at least as sweet as a genuine Ruckers. The superb musical qualities of the instrument were obviously recognised in eighteenth-century Paris even before it was ravalé, and therefore a great deal of expense and attention was paid to its external decoration. So much attention would surely not have been expended on the decoration of this instrument in 1750 unless it were already recognised as a fine and beautiful-sounding instrument. Both of the eighteenth-century ravalements were carried out extremely competently and professionally and respect all of the original Flemish acoustical material without compromising the musical qualities of the instrument in any way. Indeed the ravalement alterations would only have improved the qualities and usefulness of the existing instrument. It is, without a doubt, the most important and interesting instrument that has ever passed through my hands in my 45-year career! 'The local unit of measurement used in the study and restoration of a Franco-Flemish harpsichord', 35. Tage Alter Musik in Herne, Cembalo, Clavecin, Harpsichord – Regionale Traditionen des Cembalobaus, (Herne, 2012) 43-71..